DOWN SYNDROME - The language of the hands! A 'phantom picture' for the hand in Down syndrome (incl. anthropometric data). 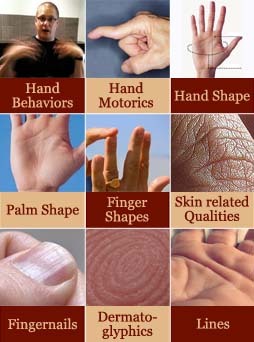 Multi-Perspective Palm Reading describes the full perspective of the hand in Down syndrome: 6 out of the 7 hand-perspectives are involved, though it's possible to make a reliable hand-diagnosis with only the dermatoglyphics, hand shape & finger morphology! Down syndrome, is a genetic disorder that is featured with a trisomy (= an extra chromosome) on the 21th chromosome, see picture below. Studying the hand in Down syndrome is an excellent exercise to learn more about how hands can be used reliably as a diagnostic tool in a medical perspective. Multi-Perspective Palm Reading describes via other themes how via a likewise systematic approach the hand can be used for the same purpose in the field of psychiatry & psychology. Re: DOWN SYNDROME - The language of the hands! "Key-elements of the hand in Down's syndrome in a nutshell: small hands with squarish palm shape, short fingers, short fingernails, palm & fingers display typical dermatoglyphics (usually featured with high positioned axial triradius on hypothenar), unusual palmar creases (very often featured with simian crease or Sydney line)." 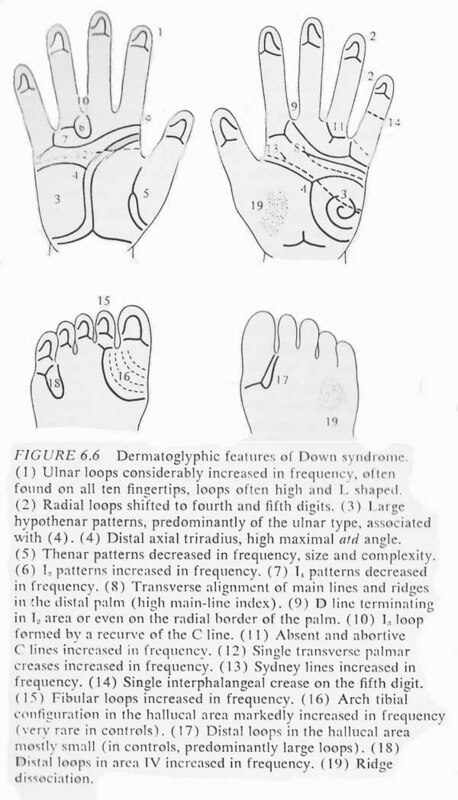 I think it is quite fascinating to see that 4 features in this list point out to the 'mount of Moon' (= the palmar hypothenar zone) - which appears to play a key role in how to recognize Down syndrome from a hand. 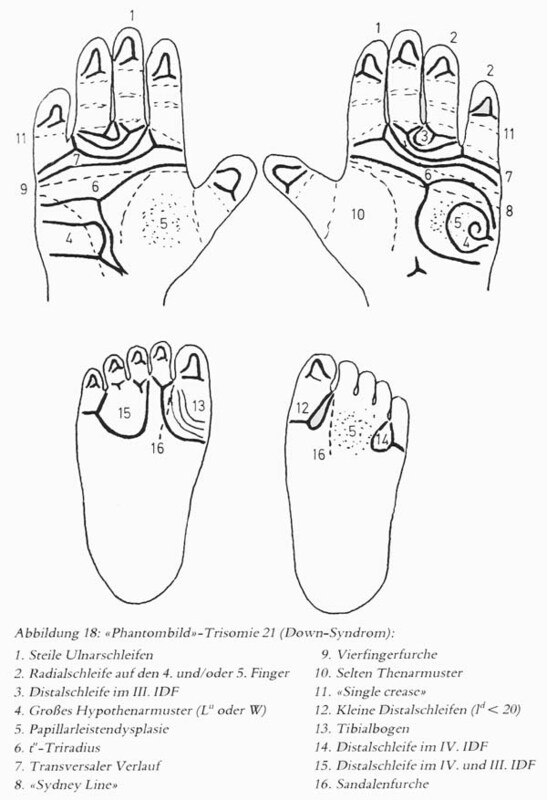 The list also shows that 'multiple perspectives' of the hand are involved: the list includes dermatoglyphic & line characteristics which relate to the palm & fingers (e.g. single crease on the fifth finger + simian crese). 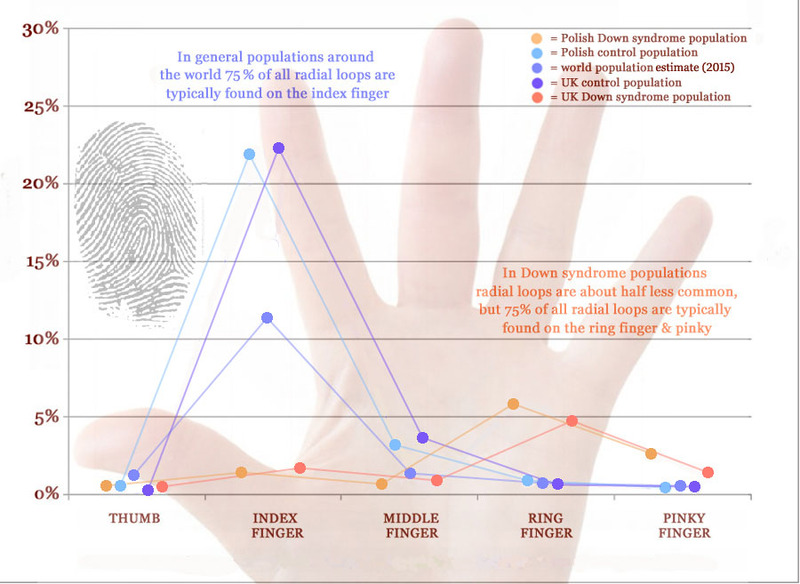 And additionally, the size of the fingers is also present among this TOP 10 (e.g. brachydactyly = extremely short fingers). How can you haven't mentioned in any of the factors presented in PDC? Ron wrote: How can you haven't mentioned in any of the factors presented in PDC? I am not sure what you exactly have in mind...? PS. PDC is not designed for assessing inborn syndromes, nor acquired severe medical- and or psychiatric disorders. But you are welcome to specify your thoughts. Well the features of the Primary Fault Factor indicates downsyndrome, as one of many in the PDC textbook. Thanks for explaining what you have in mind. Holtzman indeed describes that he has noticed that thumb dislocation (his 'primary fault factor') is frequently seen in retared individuals. But retardation can have many causes. And though Down syndrome is the most common cause of mental retardation, thumb dislocation does not belong to it's common features. From my sample I can report that only a small minority of people with Down syndrome have this thumb characteristic. (Sorry, I have no representative statistics for this hand characteristic, but so far I have seen no reports at all which point out the significance of this characteristic in Down syndrome. And because Holtzman also does not mention Down syndrome specificly, this can only implicate that this thumb characteristic is unlikely to rank high in the long list of hand characteristics for Down syndrome). PS. Did you have any other hand features in mind? Ron wrote: Well the features of the Primary Fault Factor indicates downsyndrome, as one of many in the PDC textbook. Ron, I've re-read this chapter but can't find where Arnold says anything about it indicates Down Syndrome? I didn't notice anything in Martijn's list about the thumb, but in my experience many people who have Down's syndrome have a short and STIFF thumb.... and strong willpower to go with it! kind-of opposite of flexible dislocated type illustrated in "Primary Fault Factor"? While the 'short (low set) thumb' is known as a typical characteristic in Down syndrome, I only found a study reporting a percentage of 20%. Which implicates that it probably doesn't belong in the TOP 10 of the most significant hand signs in Down syndrome. (My estimate is that a short thumb is also seen in a considerable percentage of the general population... possibly somewhere around 5%). ... In one of my earlier posts I mentioned that 'short fingers' [technically named: brachydactyly] belongs to the TOP 10 essential hand features in Down syndrome. 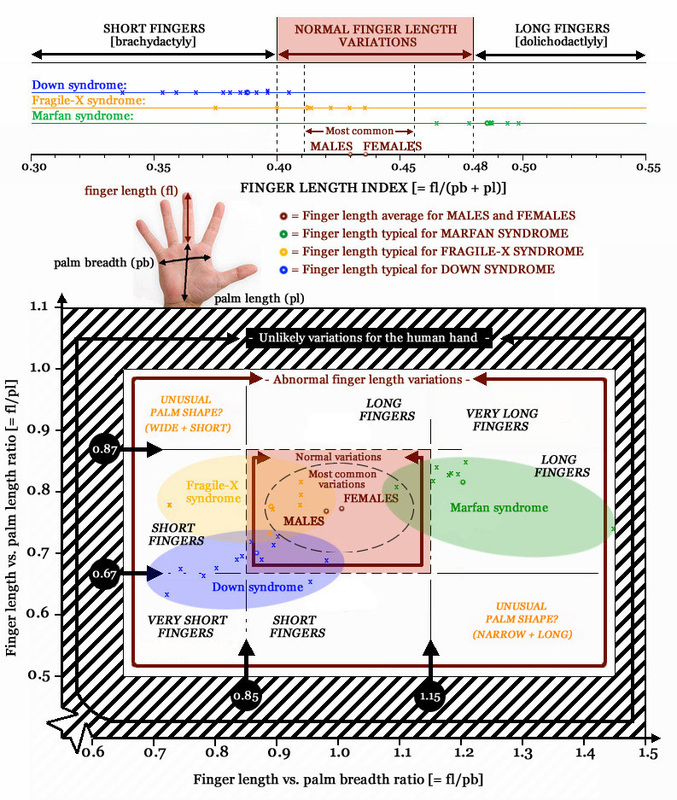 The picture below presents detailed guidelines in order to recognize this feature in Down syndrome (by using a new concept: the 'finger length index'). ... In one of my earlier posts I mentioned that a 'radial loop on the ring finger' belongs to the TOP 10 essential hand features in Down syndrome. Down syndrome (trisomy 21) is a genetic disorder caused by the presence of a trisomy on chromosome 21. The hand system in Down syndrome varies always in at least 4 out of the 5 major perspectives from the hand in ordinary people; the proportion & skin in both the palm and the fingers are always involved. 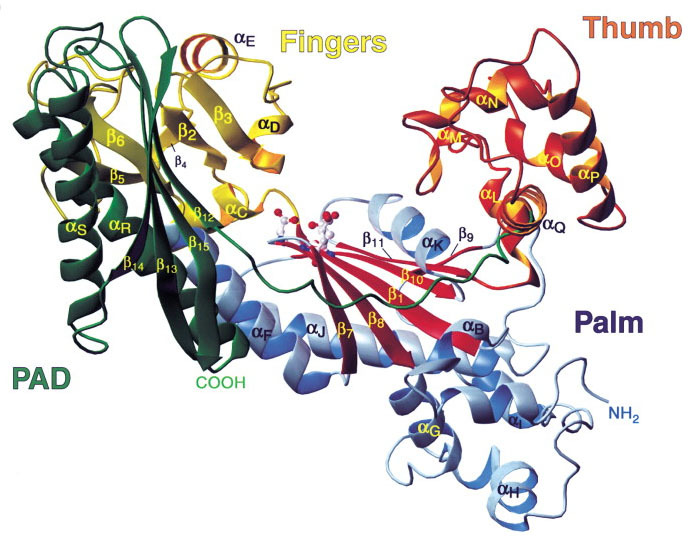 But usually the 1st major perspective - function - also gets involved with hyperextensible finger joints, a charteristic that relates to flexible hand motorics which is very commonly present in Down syndrome. 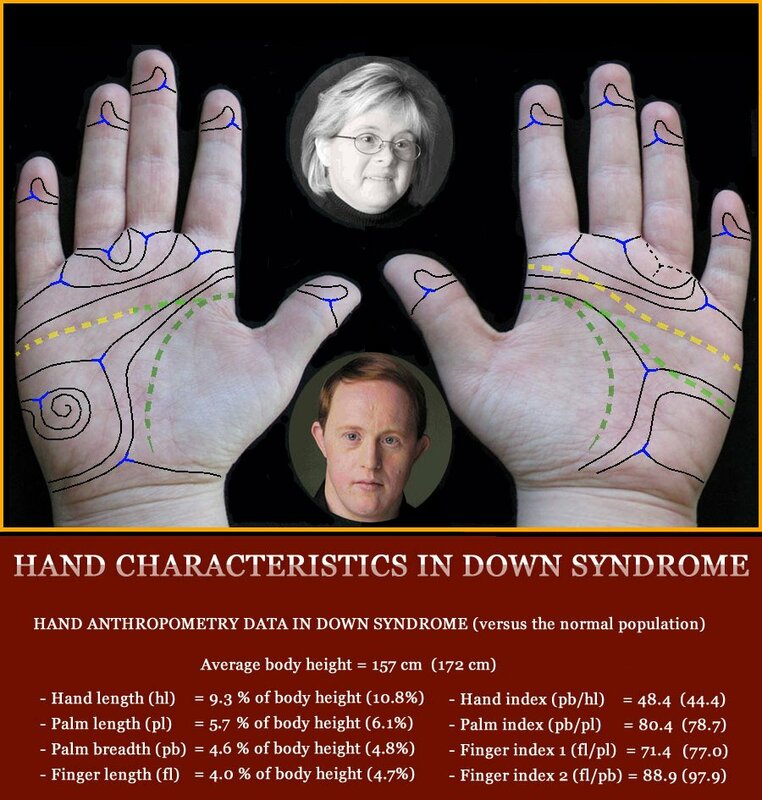 Down syndrome & the hand system according Multi-Perspective Palm Reading! 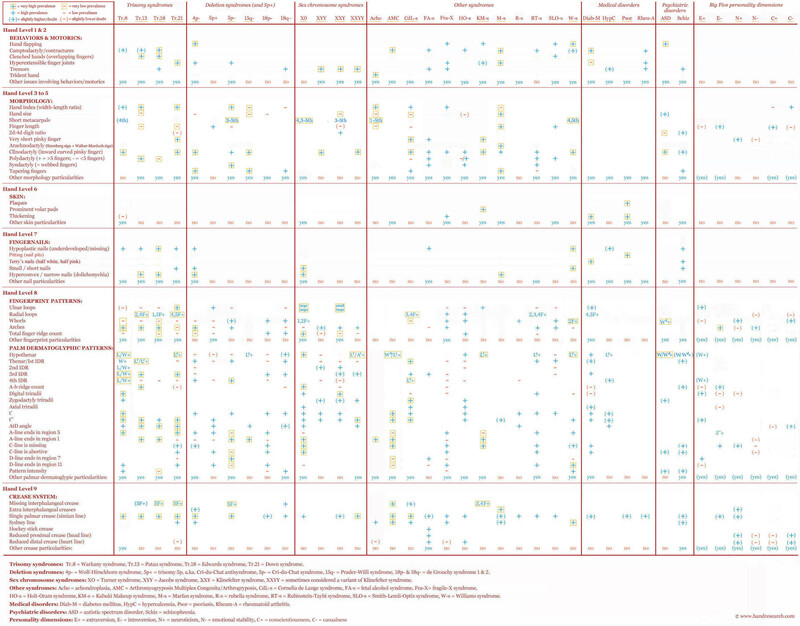 New article: Scientific hand charts for Down syndrome! - Hand level 2: hyperextensible finger joints. - Hand level 3: short, broad hands. - Hand level 4: broad palm. - Hand level 5: short fingers, very short 5th finger, clinodactyly of the 5th finger. 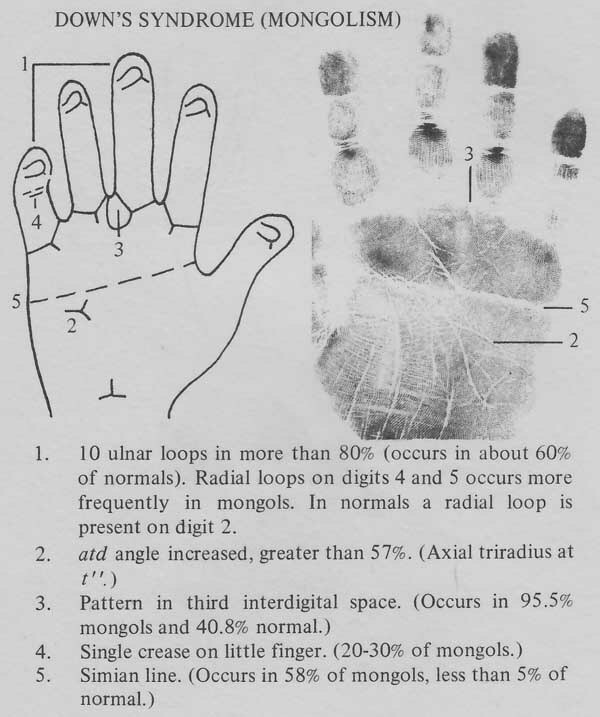 - Hand level 8: usually all- or the large majority of fingerprints display an ulnar loop (10 likewise fingerprint patterns represent 'monomorphic hands'), often a radial loop is found on the 4th finger and/or 5th finger; the palm typically bares a pattern in interdigital zone 3 + the hypothenar, with the latter usually featured with a high positioned axial triradius (featured with a high AtD angle) often combined with an ulnar loop. 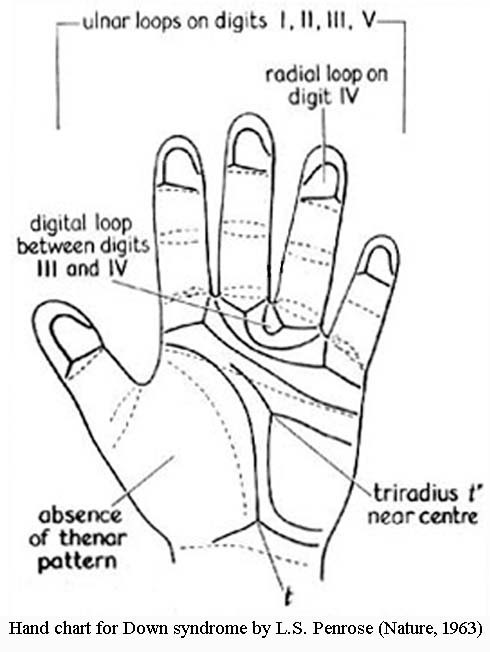 - Hand level 9: single palmar crease (a.k.a simian crease), single interphalangeal crease on pinky is sometimes present."